A wildlife park has banned visitors from wearing leopard print clothing, because it is confusing the animals. Chessington World of Adventures Resort today introduced the zero-tolerance policy on animal print and even brought in bouncers to enforce it. Zookeepers noticed the trend for animal print clothing had caused animals to try to communicate with those wearing it, or to run away in fear. The ban follows the launch of a new experience "ZUFARI: Ride Into Africa! ", which sees visitors journey off-road on a safari adventure. They come face-to-face with white rhinos, giraffes, flamingos, water buck and other antelopes such as blesbok. Since the launch of the 22-acre Serengeti-style trail, Chessington's zookeepers have noticed the wildlife "becoming puzzled" when spotting visitors that look like them. 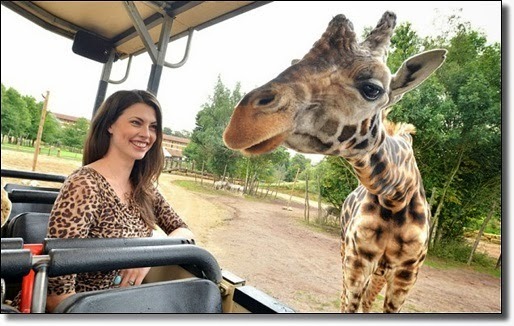 ZUFARI spokeswoman Natalie Dilloway said: "ZUFARI lets visitors get so close to wild species that if someone wears the same pattern to the animal's coat they can become over friendly." "If they wear the pattern of its predator, it has the opposite effect and the animals become afraid and run away." 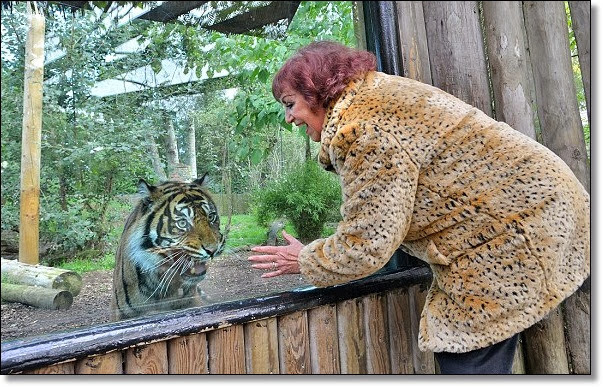 Animal print-wearing visitors will be handed grey boiler suits and ordered to wear them everywhere in the park so as not to antagonize or excite other animals including lions and tigers. Spots and stripes: Chessington World of Adventures Resort today introduced the zero-tolerance policy on animal print and brought in bouncers to enforce it. The resort has hired Animal Print Bouncers to identify anyone wearing leggings, coats, tops, hats or dresses which flout the regulations. 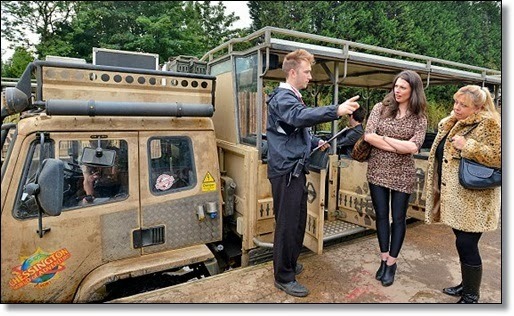 Banned prints at Chessington World of Adventures Resort include zebra, giraffe, leopard, cheetah, tiger and even hyena and African wild dog. 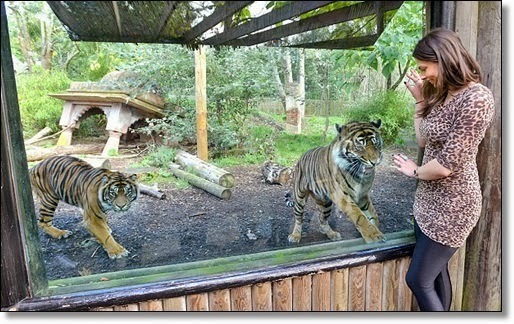 Ms Dilloway added: "Since the launch of ZUFARI, guests have interacted with the animals more closely than ever before." "We have noticed a lot of animals becoming baffled by animal-print-wearing guests. The enclosures at ZUFARI have been designed to replicate the conditions species face in the wild." "Therefore it's no wonder animals are getting confused when they see what looks like zebras and giraffes driving across the terrain in a 7.5 ton truck." Animal behaviour consultant Dr Candy D'Sa, of Alton, Hampshire, said colors and patterns can provoke strong reactions in animals. Zero tolerance: Those who break the rules will be forced to wear boiler suits. "We kindly ask guests to refrain from wearing animal print at the park." Animal behavior consultant Dr Candy D'Sa, of Alton, Hampshire, said colors and patterns can provoke strong reactions in animals. She said: "Certain coloration's give warning signals to other animals. For instance the yellow and black stripe of a bee is there as a warning and leopard print or tiger print will trigger some sort of instinct as well." "Colors and patterns are there for a reason in nature - it's about predator-prey interaction. My dog has probably never seen a snake in her life but I would expect her to act with trepidation if she saw a stripy snake as opposed to a plain one." "Movement is also a key trigger. Big cats will start getting interested if someone limps past their enclosure because they look weak." "Possibly the worst thing you could do is limp past the lion or tiger enclosure in a zebra print outfit."